First of all, we're thrilled to announce that the United States Postal Service still exists. Whether you appreciate them or not, they're still wearing those charming uniforms, delivering written correspondence, and apparently making stamps even better. Because scratch-and-sniff stamps are here. As in, smell-o-vision, but for mail. As in, the future. 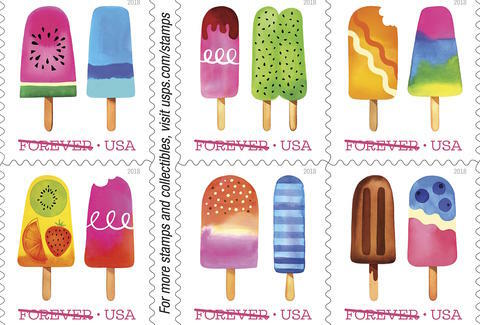 The Frozen Treats Forever stamps are the first scratch-and-sniff Post Office stamps in US history, and they "feature illustrations of frosty, colorful, icy pops on a stick." There's just no better way to simultaneously support our nation's greatest mail-delivering institution, give the gift of a moderately pleasant smell, and be endearingly retro. These little slices of summer will be unveiled in Austin, Texas, a city where frozen treats do not go unappreciated, on June 20. But you can pre-order online now, and they'll be delivered, one assumes by the Postal Service, shortly thereafter. If you're really into stamps, you can stream the ceremony at the USPS Facebook page at 6pm CDT. Your booklet will contain 20 stamps -- 10 designs total, with two frozen treats per stamp -- and while you may not have sent 20 letters in your life, this is your chance to start. The artwork is by Margaret Berg, and the design is by Leslie Badani. Also that "Forever" isn't just branding. These Frozen Treats stamps are First-Class Mail Forever, "which will always be equal in value to the current First-Class Mail one-ounce price." Plus, if you don't ever end up sending those letters, you can just scratch and sniff them yourself.